Astonomers using NASA’s Hubble Space Telescope have discovered surprising new information regarding a massive, one-of-a-kind star, whose behavior has never been seen before in our Milky Way galaxy. The star’s new nickname, ‘Nasty 1,’ is a play on its official catalog name, ‘NaSt1’ – because the rapidly aging star is just that weird. 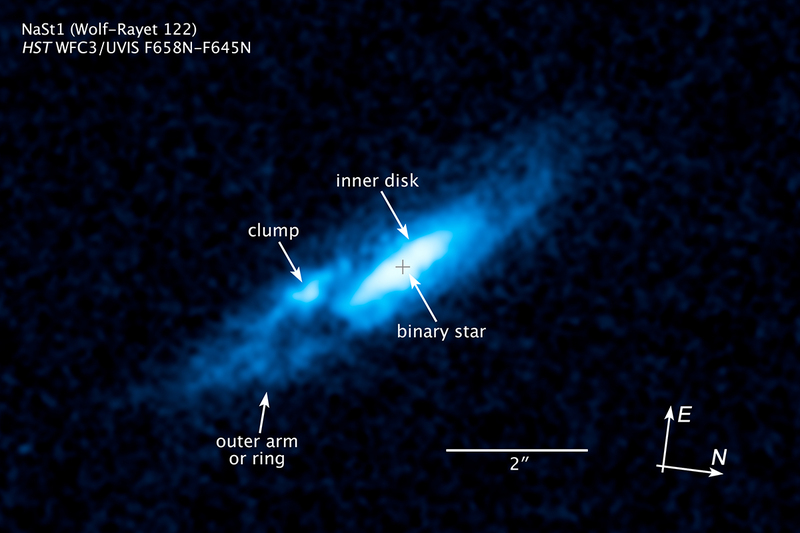 Nasty 1 was originally identified as a Wolf-Rayet star when it was first discovered several decades ago. Wolf-Rayet stars are incredibly hot, massive stars (20x larger than our sun) with a high rate of mass loss – some believe they represent a final burst of activity before a huge star begins to die. The thing is, Nasty 1 doesn’t look like your usual Word-Rayet star. Astronomers expected to see twin lobes of gas flowing from opposite sides of the star. Instead, they saw a pancake shaped disc of gas encircling the star that is nearly 2 trillion miles wide! This disc could be the result of a binary interaction – which there are very few examples of in the galaxy because this phase is so short-lived. The Team’s Scenario: A massive star evolves very quickly, and as it begins to run out of hydrogen, it swells up. Its outer hydrogen envelope becomes more loosely bound and vulnerable to gravitational stripping, or a type of stellar cannibalism, by a nearby companion star. In that process, the more compact companion star winds up gaining mass, and the original massive star loses its hydrogen envelope, exposing its helium core to become a Wolf-Rayet star. But the mass transfer process in mammoth binary systems isn’t always efficient. Some of the stripped matter can spill out during the gravitational tussle between the stars, creating a disk around the binary. The team’s results will appear May 21 in the online edition of the Monthly Notices of the Royal Astronomical Society. ← Synthetic Cadaver Breathes, Bleeds, and Moves – Totally Awesome or Totally CREEPY?